All the useful information that you need to know before sending money with InstaReM! 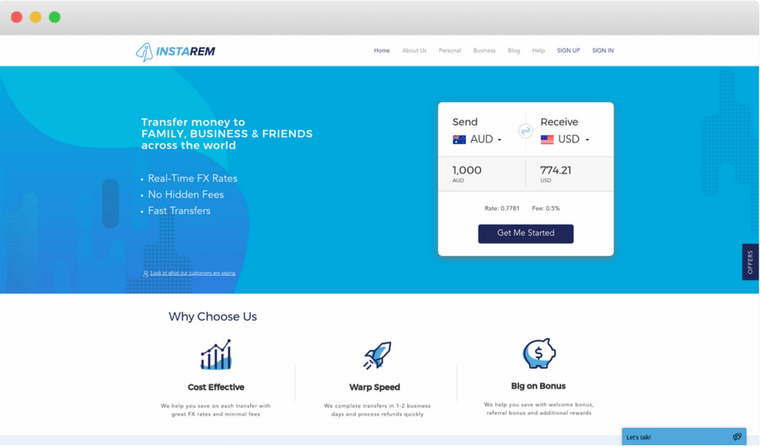 Launched in the year 2014, InstaReM has its headquarters in Singapore which offers digital cross-border money transfers to both individuals and businesses. Currently, the company is offering its services in 60+ countries with major countries of Asia in over 22 currencies. However, there are no limits for business transfers in most of the countries where InstaReM is serving. InstaReM India is not providing 24*7 customer assistance, but one can contact them at the time provided by the company. It has also been using the best security measures to provide worry-free transfer services to users. We overall rate 7.5 out of 10 to InstaReM. Pricing : How much does InstaReM cost? InstaReM charges different fees in different countries. It charges around 0.5% for transfers in Hong Kong and Australia, and 0.25% for transferring money from Singapore. In India, InstaReM charges around 0.25% to 1.00%, depending on the country you are sending money to and the mode you choose. InstaReM offers live mid-market exchange rates which are much higher than any of the banks. So, you will get the live market prices to transfer the currency to any other country. Besides this, one can also get the rate alerts from InstaReM in various currencies. If you also need to start the alerts then click here. InstaReM does not have any other fee, but if you transact with the credit card, you may have to pay extra because many credit card companies charge for using their services. Many other competitors of InstaReM are even offering free transfers, so if we look at the transfer fee of the company, we feel it a bit costlier. Therefore, we rate it 8 out of 10 in the pricing section. Transparency: Does InstaReM have any hidden fees? InstaReM does not have any hidden fees. The recipient will receive the amount that has been shown by the company during the transaction and no other fee will be deducted from the amount. One can track the transfer done on InstaReM on its home page. You will find the track transfer head, where you have to enter the transaction number as well as the registered mobile number. After submitting, you will get the details of your transaction, and in how much time it will be received in the recipient account. One can transfer a minimum of INR 4,000 from India with different maximum limits. However, one can send up to INR 17 Lakhs in a financial year, which is a regulatory limit. So, as we see that the company is not having any hidden fees as well as simple tracking procedure, experts of Exchange Rate IQ give it 9 out of 10 in the transparency section. Transfer Speed: How long does it take to send money through InstaReM? InstaReM is variable with transferring the funds and it solely depends on the country from where you are sending the money and the recipients’ country. It can transfer funds in 24 hours across Asia while taking an average 2-4 days for transferring funds in other parts of the world. The company has been partnering with 8,000+ banks and reaches about 3.25 million people for transferring the funds in 60+ countries. Well, many companies offer instant transfer, but the same is not offered by InstaReM, therefore, we rate it 7 out of 10 for its transferring speed. Security : Is InstaReM Safe? In the world of cyber crimes and attacks, it is very much essential to increase the security to minimize as well as control the damage. So, InstaReM is licensed in various countries, including the EU, Australia, India, Canada, Hong Kong, Malaysia, and Singapore. Besides this, if you are using the company for transacting with it, it will use the ID proofs provided by the government, including license, Pancard, or any other proof of identity and proof of address. InstaReM also monitors various devices by which the users are using the website or app and monitor traffic patterns so that it can protect the website from any cybercrime. It is also registered with other authorities in the US, Australia, Canada, and Singapore. We can see that the company is highly secured and use various measures to protect the data of users from any cybercrime. It has also been using good manpower to track any unethical activities on its website. So, we provide it 10 out of 10 ranking for its security measures. InstaReM has been providing assistance services to its customers via call and email. You can contact them from Mon to Fri 9:00 am to 9:00 pm IST and Sat to Sun 8:00 am to 11:30 am IST. InstaReM offer coupons time to time to provide cash backs as well as free transfers to the users. InstaReM first transfer coupon code which customers can use is “SAVEMORE”, where they can get up to INR 300 discount. The company offers referral benefits to its customers. If you refer the services through a unique link provided by the company to any of your friends, you will receive 400 InstaPoints, while your friend will get 475 InstaPoints (75 welcome bonus + 400 referral points) once they complete the first transaction. You can redeem these points in the next transfer (only 400 points can be redeemed in one transaction). The company also offers cancellation services on clicks, but one may not get the refund if the amount has already been transferred to the recipient’s account. InstaReM is an alternative option against many banks who charge more for transferring funds overseas. The company is cost-effective for small transferors but have to pay more fees on larger amounts. Therefore, we rate 8 out of 10 to it a user experience basis. So, if you want to start the transaction with InstaReM log in here. Coverage: How many Countries & Currencies does InstaReM support? InstaReM is covering about 60+ countries across the world and has a network of 8000+ banks in 55+ countries. It offers multi-currency transfers from AUD, EUR, MYR, INR, USD, SGD and HKD. By using the services of InstaReM, one can send money to the following countries. The company also does not allow third-party payment, one-off transfers and forward contracts. Therefore, for its coverage, we provide InstaReM 7 out of 10, because it still has vast opportunities to grow and provide it accessible to people across the world. I've had a great experience with InstaRem. Their customer support is brilliant and very prompt. The people fronting the chat interface are knowledgeable and solution oriented. I'll definitely be a regular user for all my future forex remit transactions. able to send ontime when ever required. I rarely comment on things but this is ridiculous when I have to submit my bank statement every single time for my transaction as according to your customer service that my bank did not submit information with the money. If that is the case, why bother asking us to quote the transaction number with it? Even as I am frustrated, the customer service just continues to speak like a robot and proceed with telling me the information without even stopping to understand my frustration. To make things worst, for me to terminate my account, I will need to proof my bank statement as well just to take my money back. This is bad customer service!!! Instarem is good, fast and economical. But I think GUI needs to be polished further for both the Android App and the Website. Still waiting for debit/credit feature to come back. Well. at the beginning it was great but then, they removed the credit/debit card feature and I couldn't use this service anymore. I have been waiting for them to put the feature back but, still waiting... sad, coz this is a great app. The transaction is taking more than 10 minutes and up to 2 days!!!!! !, which is very bad in this competitive world. You cant survive with this long term transfer period. So fix it. I have shared it on the call with rep. I love Instarem as compared to eremit and uae exchange. Smooth , swift and reliable. okay- Decent treatment and very little friction. Go to the InstaReM website. Select the country you want to send funds to and enter the amount you want to send. It will show you the amount that will be received by the fund, and the fees you need to pay. Click on “Register With Us”. Here you will be redirected to a new page, InstaReM Sign up. Select that you want an individual or business account. Enter the email and password as well as the country you stay in. Enter all other personal details of yours as well as the recipient. Sent the funds and track the same by tracking number provided by the company after the transaction.